My daughter’s second grade class read this book for their book club last month. I hadn’t ever read it before now. 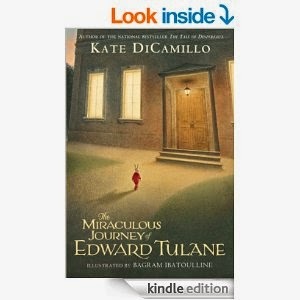 Edward Tulane is a china rabbit. He belongs to a girl named Abilene and he lives a very comfortable life. He wears fancy clothes and gets to sit at the big table with the family for dinner. Abilene loves him. A lot. Unfortunately for Edward, he is grumpy and criticizes everything. He does not love as he should. Abilene goes on a big boat and Edward is lost overboard. He falls to the bottom of the ocean, and there starts a very long and difficult journey for him. As he travels from place to place and from person to person, he slowly begins to learn how to love. I didn’t love this book. My daughter’s teacher said it is one of her favorite books, and a lot of the kids in the class gave it five stars, but for some reason it just didn’t click with me. I thought it was slow, kind of boring, and predictable. Some of the characters are a little scary, and there is a very sad part in it. The lesson, though, is really good. Loving those around you, really loving them, and enjoying the time you spend with them, while you have them, is an invaluable lesson. I read this book… I didn't get it at all. I completely understand where you're coming from. It definitely wasn't my favorite book. Thanks for your comment!